As South Korea’s first ICO, ICON is gaining a lot of attention but also has the team and technology to back it. This high-potential platform will be a contender to watch and will bring competition to larger and established platforms such as Ethereum & NEO. The goal of the ICON Network is to “Hyperconnect the World” by providing a network that will support Smart Contracts & DAPPs to enable communication between different blockchains such as Ethereum & NEO. The framework has features built in to help speed up industry adoption such as Blockchain-based Identity, Payments & Exchange on their decentralized exchange, Artificial Intellignce & Scalability. This project is relatively new with the token sale launch in Q4 of 2017 and recent addition to Binance in mid-December. It immediately went on a steady climb and is now consolidating with a current market cap of $3.8 Billion. There are currently 400 Million ICX with approximately 378 Million in circulation. An additional 400 Million tokens are planned to be minted after the Mainnet launch. ICON Foundation: Non-profit foundation located in Switzerland. Leading the ICON Token Sale and supporting the community in a variety of ways. theloop: Blockchain engine development company headquartered in Korea. In charge of ICON Nexus development and other Smart Contracts. For being a new project, ICON boasts a very large and experienced team with sub-teams to focus on the various aspects of the project. They have a strong advisory list, a Foundation Council, Blockchain team, Artificial Intelligence team and Marketing team. The ICON Mainnet will launch on January 24, 2018. The 1st ICON Annual Summit will be hosted at the Lotte World Tower in Seoul. More info can be found at their website as well as on this summary video created by a fellow Node Insider! After its exchange debut, ICON ran up to a high of $12.52 in early January and is now consolidating those gains. Below is a chart of the 4-hr ICX/BTC pair. During December and into early January, ICX gained nearly 700% against Bitcoin! It hit a high of 8500 satoshi and is now about 20% from the highs. It’s currently forming a new base above the 6600 level and has a strong support level at 5500. A close above 7900 will confirm the start of the next leg up and perhaps a test of the highs. The recent consolidation has allowed for the indicators to cool off and is potentially setting up for a new run. Going into 2018, I see ICON as an emerging leader and expect that it will finish the year much higher than it started. You should keep an eye on this one! The volatility in cryptocurrencies makes it an attractive market for those that like to day trade or swing trade. It’s not unusual to see increases of 50%, 70% or even 100%+ in just a few days. However, the volatility cuts both ways and the smaller cap names can also drop by large percentages just as quickly. Not everyone wants to look at charts all day so is there room for those interested in investing for the long term? Yes, absolutely! My portfolio is split into two major portions. I’ll use one part to take advantages of day trades and will be very active with that part of the portfolio. Simultaneously, I’ll keep core positions that I like to accumulate over time and hold for months or longer. This second group is broken into Long-term and Intermediate-Term holdings. The key is picking the more stable and promising projects for longer-term holds. As shown in the chart below, my trading portfolio can be up to 35% of the total. For some that may be too high and unless you’re comfortable or experienced with trading, I would suggest making it a much smaller percent of your total crypto holdings. 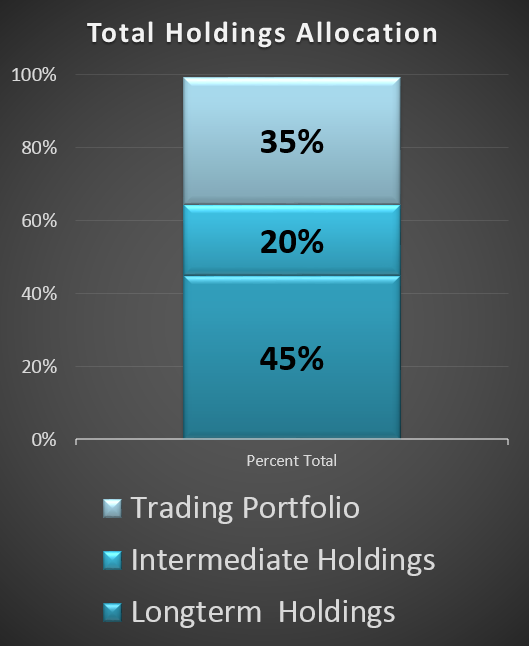 Trading Portfolio: Positions held between a few hours to a few days. Intermediate Holdings: Held for weeks to months. Long-Term Holdings: Held for months to years. So how does one pick which ones to hold with so many new names popping up all the time? First off, you need to hold some of the market cap leaders as these will also have institutional sponsorship which limits the downside risk some. It’s no surprise but this would include Bitcoin & Ethereum. You can make room in your portfolio for more speculative names that you think will go up 10X or 100X in a few years but I would suggest that you limit those to just 10-20% of the portfolio. It’s impossible to know which will be the big winners in 2-5 years so you also have to make room for new entrants as they appear. For example, NEO is a relatively new name that hit my radar in July but I now consider a core holding. Currencies, Platforms & Industry Specific Services. There are hundreds of coins that are really just tokens without a lot of long-term use case. I generally ignore most of the smaller cap names (less than $50M). Look for things like good underlying technology, industry niche, demand or use case, innovation, white paper and road-map, strength of the team, scalability, etc. Avoid the over-hyped and over-pumped small-cap names. Those may be good for shorter to intermediate trades but not long-term holds until they prove themselves more. These three categories are broad and can certainly be subdivided further but are summarized for simplicity sake. Let’s look at examples for each one. Currencies: Simply those whose primary function is to be a digital currency for daily exchanges and transactions. This would include names like Bitcoin, Litecoin, Dash and Monero. 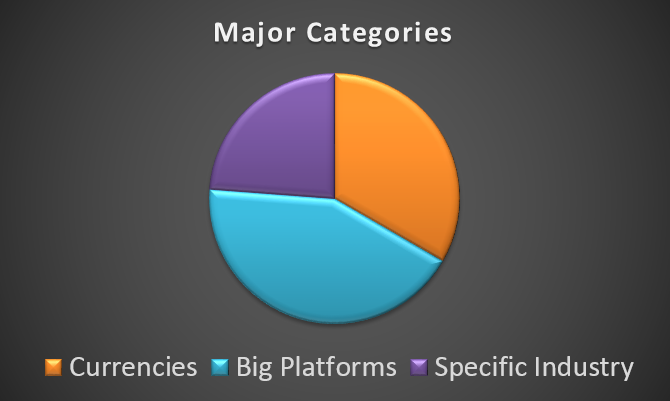 Platforms: This is referring to those that are establishing the infrastructure and ecosystem for other cryptocurrencies to build on top of. The most notable example is Ethereum with all of the ERC-20 tokens and apps being created on its blockchain. Other names to consider are NEO, NEM, IOTA , Stratis and Waves. Industry Specific Services: Examples include names such as TenX, OmiseGo, Steem, Iconomi, Golem and Siacoin. This category is very broad and includes many subcategories. For example, Sia is specific to distributed cloud storage while TenX is targeting payment processing. The list can go on but these are often tokens that are built on another platform such as Ethereum or NEO. This could also include some ICO’s. Does This Mean You Should Never Sell? Even though something may be labeled as “long-term” or “intermediate holding”, it does not mean sell rules go out the window. Even with these, I will never ride something down 60%, 70% or more. You still should have an absolute stop level in place even if you give it a lot of room. Have a plan. This is why studying technical analysis is important even for long term holds because it will help you time your purchases better as well as help you understand key support and resistance levels. You should also have a plan to sell and take profit eventually. There are many ways to determine this and I recently posted some videos on sell rules. Many of these guidelines can be also applied to longer-term charts such as the daily or weekly ones. https://nodeinvestor.com/wp-content/uploads/2017/11/investor-coinstack.jpg 1365 2048 Node Investor https://nodeinvestor.com/wp-content/uploads/2017/04/NodeInvestor-logo1-300x170.png Node Investor2017-11-09 17:32:332017-11-09 17:33:44Are you an Investor or a Trader? Several of you have asked me for book recommendations on technical analysis and trading. Here are my top book picks for those wanting to learn more about the topic. There are many good ones out there so narrowing it down to 5 was no easy task. It’s also important to keep in mind that while technical analysis is incredibly important to trading, it’s not the complete tool-set. You must also learn about trading psychology and money management. Those disciplines are just as important, if not more so. Finally, remember that technical analysis is a skill that must be applied within the context of the general market conditions. It’s not just a mechanical set of rules to follow but is often more of an art. Over time, you will get better at it if you continue to learn and practice. In the video linked below, I discuss a little more about each book and why I like it. I also point out some great titles to consider beyond these five. 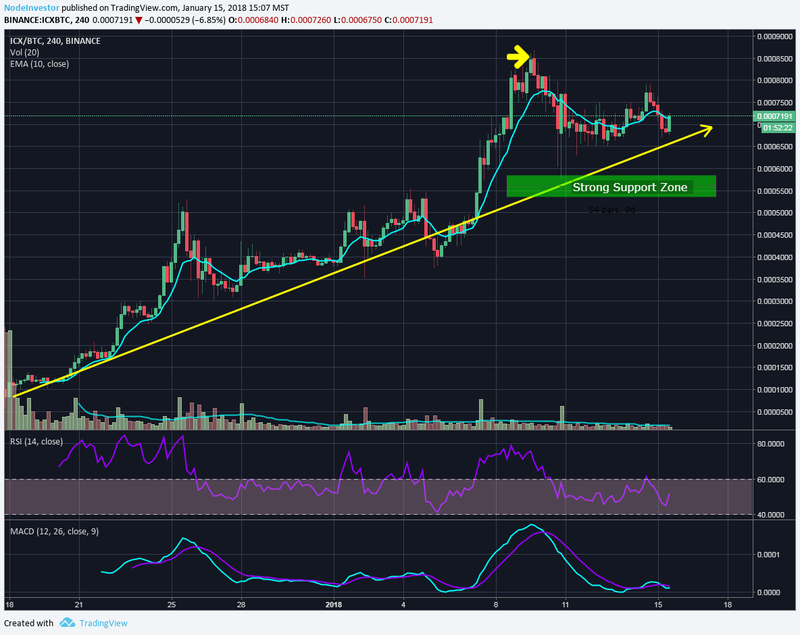 Stellar Lumens Preparing for Another Launch? https://nodeinvestor.com/wp-content/uploads/2017/05/Stellar-Lumens-Launch2.png 720 1280 Node Investor https://nodeinvestor.com/wp-content/uploads/2017/04/NodeInvestor-logo1-300x170.png Node Investor2017-05-12 04:23:082017-05-12 16:29:27Stellar Lumens Preparing for Another Launch?